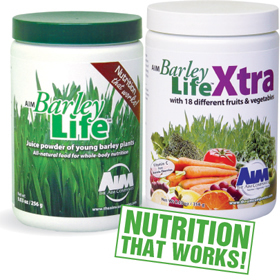 AIM BarleyLife for improved nutrition. Is there anyone who should not use BarleyLife? BarleyLife is a whole food concentrate, so most people should be able to take it. Those with severe medical problems or complications should consult a health practitioner before introducing something new to their bodies. Those on a restricted diet (especially in regard to “green foods”) should also consult a health practitioner. I started taking BarleyLife, and I feel worse. Why? When you make a change in your diet, your body often goes through a cleansing known as detoxification. This can manifest itself in fatigue, rashes, and headaches. It is your body flushing out toxins. Oligodextrin is made from whole brown rice using a natural hydrolysis process without the use of acids, alkalis, or sulfites. Brown rice oligodextrin is a complex carbohydrate that functions as a buffer between the enzymes and other molecules, stabilizing and maintaining the nutrients. What makes BarleyLife so smooth tasting? A state-of-the-art, spray dryer delivers very small particles. The small particles result in maximum dispersion, providing more uniform distribution in liquid. The small particle is extremely soluble in liquid, producing less grittiness. The result is a smooth texture, great taste, and excellent solubility when mixed in water or juice. How much natural sugar is in each 4 g serving? Each 4 g serving contains only 1 g of natural sugars, derived mainly from the barley juice. Yes, BarleyLife capsules are completely vegetarian in composition as they are derived from pine sap. They are acceptable in a vegan diet. How quickly do the capsules dissolve? AIM’s vegetarian capsules have been shown to dissolve within 5 to 10 minutes in water. Dissolution may be more rapid in the stomach’s acids. Why is Lo Han used in BarleyLife Xtra? a member of the cucumber and melon family. Used for centuries in China, Lo Han is 300 times sweeter than sugar. This allows us to minimize the amount of natural flavoring added and maximize the nutrients from the barley juice, fruits, and vegetables while providing a delightfully sweet fruit taste. Is there more vitamin C in BarleyLife Xtra than in the other varieties of BarleyLife? Yes, the percentage of vitamin C per serving is larger in BarleyLife Xtra than other BarleyLife products. Acerola cherry powder, used in BarleyLife Xtra, is one of the richest sources of natural vitamin C. The 18 different fruits and vegetables used in BarleyLife Xtra bring their nutritional content to the mix, enhancing the nutritional profile, including increased levels of vitamin C at 34%. Is the “natural cream flavor” from dairy cream? The natural cream flavor is a combination of naturally derived ingredients that mimic the taste of cream. The ingredients are derived from vegetable sources only and acceptable for vegans. The “cream” does not contain dairy products.